Stefan Dziemianowicz may well be the most knowledgeable pulp collector on the planet. He's edited huge volumes of the things, lives in a pulp mausoleum, and managed to set David J. Schow up with the Thriller pulp stories he needed. He also happens to give great interview and this one turned out so massive we split it into two parts. 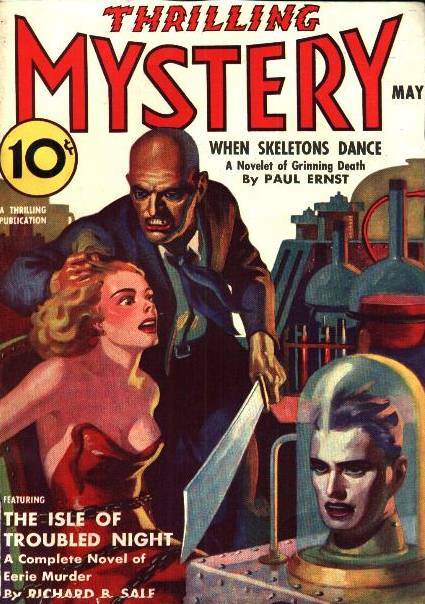 Part One (with emphasis on Thriller) follows, and Part Two (focusing on pulps in general) can be found over on our sister blog, the bare•bones e-zine. PE: “Well of Doom” seems like it would be the best realization of a shudder pulp ever filmed. Have I missed a better one? SD: Like all fans of the pulps, I imagine an alternate universe where enough shudder pulp stories have been filmed and televised that we can actually rate them, do comparative studies of their adaptations, and compile a top-100 essential shudder pulp film list whose #1 is the shudder pulp equivalent of "Citizen Kane." (I've always thought that stories such as "The Mole Men Want Your Eyes" and "Revelery in Hell" were unfairly overlooked by Masterpiece Theatre screenwriters.) Maybe in that universe we could even sponsor the World Weird Menace convention, and give out an award—The Shuddie—cast in bronze from a holographic image of Rose Magowan being menaced by a whip-wielding anencephalic mutant. The fact is, so few genuine shudder pulp stories have been adapted for the big or small screen that it's pretty easy to say that "Well of Doom" is at least one of the best, if not THE best. 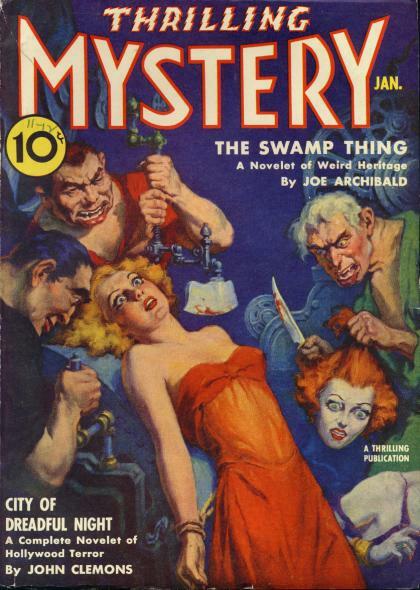 Which should come as no surprise given that the story which it was adapted from, by John Clemons (whom I believe was an actual writer, and not just a pulpsmith working under a house name), actually was published in the second-tier shudder pulp Thrilling Mystery. 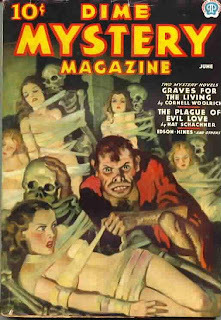 Believe it or don't, if you're a fan of Boris Karloff's Thriller, you have the unique opportunity to compare this story's treatment to another genuine shudder pulp extravaganza: Cornell Woolrich's "Papa Benjamin," which appeared in a 1935 issue of Dime Mystery Magazine, the grandaddy of ALL shudder pulps. It was also filmed for Thriller. Two shudder pulp adaptations for Thriller? I think that might make the program the leading exponent of shudder pulp television! Now, here is where I really make a stretch. If you're familiar with Thriller, then you'll certainly be familiar with "Masquerade," the adaptation of Henry Kuttner's hilarious story from Weird Tales. 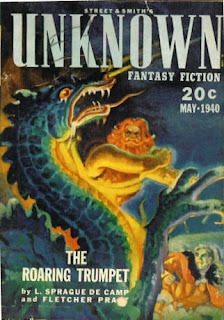 (I'm willing to bet that Kuttner wrote it originally for the exemplary modern fantasy pulp Unknown, which had folded by the time it was published in Weird Tales. A bunch of stories intended for Unknown made it to Weird Tales that way.) 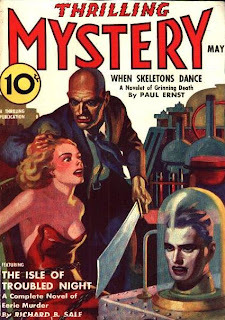 Henry Kuttner placed more than a few stories in the shudder pulps, among them Horror Stories, Thrilling Mystery (a HUGE market for him) and Strange Detective Mysteries. It doesn't take too much analysis to see that "Masquerade" is a comic riff on the old shudder pulp formula: a couple stranded overnight at a creepy old house whose creepy old residents have a menacing aura of the supernatural about them. I'll leave it to fellow Thriller aficionados to decide whether "Masquerade" deserves to be spoken of in the same breath as "Well of Doom," or even "Papa Benjamin." And lets stretch even a little further. Your question was whether the Thriller adaptation of "Well of Doom" was the best realization of a shudder pulp ever filmed. If we expand to include film as well as television, you open the door to a host of latter-day splatter films that are clearly struck from the classic shudder pulp template. But rather than look ahead, lets look back over our shoulders. One of the best shudder pulp realizations that ever made it to the screen was the 1931 Universal film The Old Dark House, adapted from the J.B. Priestley novel of the same name. It has all the standard elements of a shudder pulp story, and it appeared two years before the shudder pulp formula reared its perverted little head in Dime Mystery Magazine. In fact, it shares similar shudder pulp inflections with The Black Cat, Universal's 1934 riff on Poe (though of course the film has nothing to do with Poe's story). These popular movies may well have shaped readers' tastes for shudder pulp fiction at a time when film was clearly reaching a wider audience than magazine fiction was. What do these two films have in common? That's right--both featured Boris Karloff. Who knows, maybe Boris so remembered the dynamics of these movies that he wanted to do miniatures like them for Thriller. PE: If there was another pulp even better suited to the Thriller “Style” what was it? 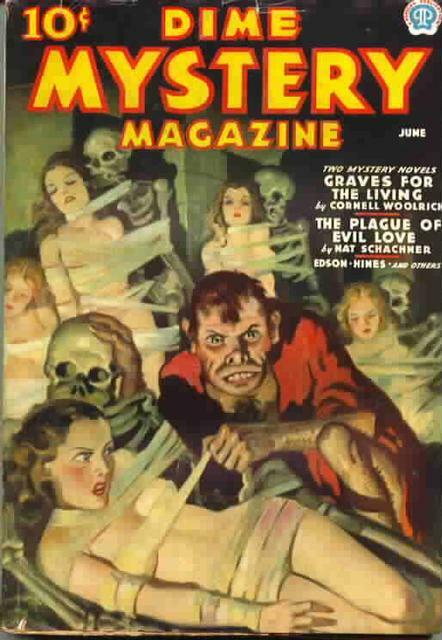 SD: I really don't think there was a magazine better suited to the Thriller style than Weird Tales, but I suspect that's because the style of Thriller as we know and love it derived from its intimate association with the magazine and its writers. I was discussing this with the estimable David J. Schow, one of the primo movers and shakers on the new DVD reissue of the complete Thriller, and we agreed that Thriller is the closest any television show came to being the TV version of Weird Tales. As I mentioned in answer to an earlier question, Weird Tales had a huge archive of stories to choose from--bigger than any other pulp magazine could offer. The sheer size of that archive ensured the sort of variety that a show like Thriller thrived on. Thriller did stories that were straight mystery/suspense, weird menace, supernatural, and comic Gothic. About the only type it didn't do was science fiction. 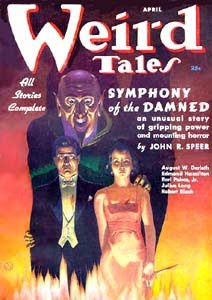 Weird Tales published all of those story types and then some. It published a lot of compact stories that lent themselves well to a half-hour or hour-long adaptation. It published some genuinely cinematic stories, and some stories that, if they weren't cinematic, had a theme or idea that smart screenwriters knew they could work into an exciting teleplay. Any writer for Thriller who went digging through the Weird Tales archive for inspiration would have found the right story for what he wanted pretty quickly. I could see some magazines yielding a story or two that would have fit well with the Thriller style. For example, Unknown/Unknown Worlds. Robert Bloch's "The Cloak" would have made a bang-up Thriller episode a la "Masquerade." Likewise from the same magazine Nelson Bond's "Prescience," a really great horror story about a psychiatrist who hypnotizes a patient and doesn't realize until midway through the patient's nightmarish recital of what he's experiencing that he died shortly after going under. (There, now, I've totally spoiled that story for any reader who isn't familiar with it.) Fantastic Adventures had a few good stories that might have worked well, as did its digest successor (sort of) Fantastic. 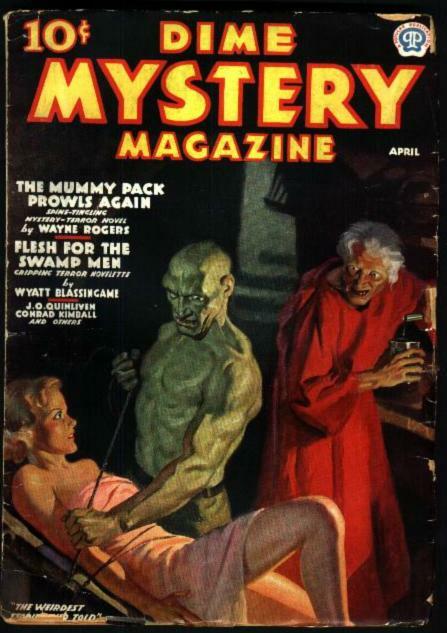 But these magazines often tried consciously to distinguish themselves from Weird Tales, or to appeal to a younger, more fannish demographic. 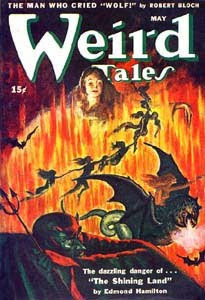 Weird Tales was, from the get go, a magazine that published the sort of modern Gothic tale that seemed to work best on Thriller. If anyone else might have given Weird Tales a run for its money in terms of stories that merited adapting for Thriller, it wasn't another magazine--it was the publisher, Arkham House. 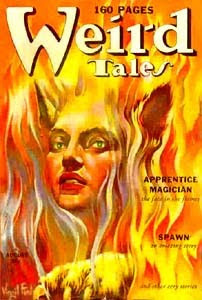 But that comes as no surprise, since Arkham House published a lot of short fiction collections by writers for Weird Tales, including quite a few that featured stories adapted for the show. Robert Bloch was an Arkham House author, and given his involvement with Thriller, both as a screenwriter an an author whose works were adapted, I'm betting he put in a good word for Weird Tales stories. Likewise August Derleth, publisher of Arkham House, who had a number of his stories adapted. In the late 1940s, Derleth was publishing in Weird Tales and advising the magazine on its contents. If Thriller was as close as television came to producing a TV version of Weird Tales, Arkham House was the closest Weird Tales came to having a book-selling arm. PE: Were there any other WT stories off the top of your head that would have made great Thriller episodes? SD: Would, coulda shoulda. There are some stories that I think could have made bang-up Thriller episodes that were never adapted. The caveat, of course, is that it all depends on who wrote the script, who directed the episode, and who starred in it. Some great stories were turned into lackluster presentations; at the same time, I never could have guessed that an otherwise unremarkable story like "The Black Madonna" by Harold Lawlor would have made such an outstandingly creepy episode ("The Grim Reaper"), thanks in no small part to the powerful acting of William Shatner. Stories I would have liked to see televised? There's Fredric Brown's "Come and Go Mad," about an investigative newspaper reporter who infiltrates an insane asylum to get the inside scoop and then gets increasingly paranoid that there is a conspiracy to drive him mad while he's there. I always thought Fritz Leiber's "In the X-ray" would lend itself well to television. In this story, a doctor discovers skeletal remnants of an unborn twin in one of his patients, and with each successive x-ray he takes, he finds that a skeletal hand is inching closer and closer to the patient's throat (you can guess how this one ends). Robert Bloch's "The Man Who Cried Wolf" is one of his best stories with an O'Henry twist; it wouldn't have needed a big budget and could have been a suspense masterpiece. Mary Elizabeth Counselman's "Three Marked Pennies," which was one of the most popular stories ever published in Weird Tales, would have made a dandy Thriller episode, though it might not have seemed scary enough. Counselman (whose "Parasite Mansion" was a Thriller episode), like Robert Bloch, published a lot of stories in Weird Tales that would have made good Thriller episodes. Likewise August Derleth, who had a number of stories ("Mr. George," "The Return of Andrew Bentley," "Colonel Markesan," etc.) adapted. His comic ghost story "Pacific 421," and more serious ghost stories such as "The Shuttered House," "Mrs. Manifold," and "Kingsridge 214" (the latter is very similar to Richard Matheson's classic "Night Call," which was adapted for The Twilight Zone) would have adapted well. I'm crazy enough to say that I think Thriller could have done a great treatment of Henry Kuttner's "The Graveyard Rats." Thriller was really good at atmosphere and moody horror. You could have suggested a lot of what goes on in Kuttner's story with a claustrophobic setting and sound effects. Thriller could have provided nicely. I recently remarked to someone that I was glad none of H.P. Lovecraft's Cthulhu Mythos stories were ever adapted for television because I don't think they would have worked, but Lovecraft had other stories that would have worked magnificently--for instance, "The Outsider" and especially "In the Vault." 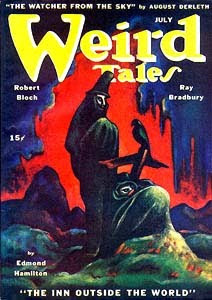 I'm astonished that none of Ray Bradbury's sales to Weird Tales ever were filmed. Can you imagine what Thriller could have done with "The Wind," "The Crowd," or "The Jar"? PE: As the biggest pulp nerd in the world, what is your estimation of the WT Thrillers? SD: I don't know that I'm the biggest pulp nerd (that's pronounced "nuuured," like the guy in American Splendor pronounced it) in the world, but I'll gladly take the title as a compliment. I strongly doubt that anyone out there is going to claim to be a bigger nerd than I am. It would require a somewhat perverted sense of self-esteem, no? What do I think of the Thriller adaptations of Weird Tales stories? By and large, I thought they were very well done, some better and some worse than others. The Thriller version of "Pigeons from Hell" remains one of my favorite episodes ever of "horror television." The Robert E. Howard story it's based on is a tour de force of gruesome horror. The Thriller version mixed atmosphere with just the right amount of physical horror to make it a very effective Gothic shocker. I've already waxed effusively about Thriller's take on Henry Kuttner's "Masquerade." I have a special fondness for Thriller's version of "The Cheaters" because I saw it some years before I ever got to read Robert Bloch's original story. One of the first Thriller episodes I ever saw (when it was in rerun) was the adaptation of August Derleth and Mark Schorer's"Colonel Markesan"; but for the let-down ending, the Thriller episode was genuinely creepy, and a vast improvement over the otherwise lukewarm story. The Thriller version of Robert Bloch's "The Weird Tailor" was the closest the show ever came to turning out a Cthulhu Mythos story, and I can still remember being creeped out, watching the jerky, inhuman movements of the tailor's dummy in that episode as it came to life. Not all of the Weird Tales adaptations on Thriller were great, but none is, in my estimation, among the episodes that I would say failed to succeed. Again, Thriller was the closest we ever came to having Weird Tales on television. To me, the sense that the show captured the spirit of the magazine, even in those episodes not adapted from Weird Tales stories, is proof that the Weird Tales/Thriller link was strong and key to the show's success. PE: How do they compare to the handful of WTs filmed for Night Gallery? SD: I greatly enjoyed Rod Serling's Night Gallery for its brief run, but I thought the few Weird Tales stories they filmed weren't as good as Thriller's. If memory serves, you're really talking only 5 stories, or about half as many as Thriller filmed, and the kitschy approach Night Gallery took to horror and the supernatural in a lot of episodes just wasn't in the Weird Tales spirit. "The Dear Departed" (from the Mary Alice Schnirring story) and "Brenda" (from the Margaret St. Clair story) were not bad, but not terribly memorable. "Cool Air," tacked a love interest and a hokey ending onto the plot germ of the Lovecraft original. "Pickman's Model," also from Lovecraft, was good. Bradford Dillman's scenery-chewing performance made up for the man in the monster suit who shows up at the end. There was one absolutely superior adaptation of a Weird Tales story on Night Gallery that, to my mind, was as good as if not better than any Weird Tales story done for Thriller. In fact, to my tastes, it is one of the best horror episodes I've ever seen on television. That was the adaptation of Fritz Leiber's "The Dead Man," which was done for one of the show's first six episodes in the truncated first season. It was a remarkably scrupulous adaptation of Leiber's story, and it's ending is one of the most frightening I can remember. In fact, it was the most frightening television episode I'd seen up to that point (and by then, I'd seen all of The Outer Limits, all of The Twilight Zone, and probably about half of all the episodes on Alfred Hitchcock Presents). I mentioned buying my first issue of Weird Tales, (Stefan's referring to an answer he gave that appears in the second part of this interview-PE) and it was to get my hands on that story. After seeing that episode of Night Gallery, I knew I had to track Leiber's original down, and I was very pleased to find how faithful the Night Gallery treatment was to it. If anything, it set the bar so high for other Weird Tales episodes that it was a little disappointing none of the others measured up to it. Stefan says "I strongly doubt anyone out there is going to claim to be a bigger nerd than I am". Thanks for coming to my rescue Stefan. Now I can point to you when people complain about my passion for collecting pulps. Great interview. Speaking of WEIRD TALES I just chose my favorite WT covers on lauriepowerswildwest.blogspot.com. I also like the magazine and love talking about it. Thanks for the link, Walker. Fabulous job on the WT piece. I think we need to get you and Stefan in the ring for some "Nerd Smackdown!" Or Weird Tales Poker. I see your October 1936 and raise you a Canadian February 1949! Talk about your basic fast-forward basic coursework in the pulps ... this is just the sort of salon I hoped would wedge its way into the THRILLER discourse, since the series is so provably beholden to the shudderers. Keep this Dziemianowicz guy talking; he knows his bones. Great interview; thanks for the info. 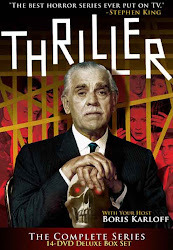 Yes, indeed; terrific overview of THRILLER's main inspiration. As for later TV adaptations of WEIRD TALES, "The Dead Man" was the first regular episode of NIGHT GALLERY following the two-hour pilot. I agree with you, Stefan, it's one of NG's best shows and a memorable exercise in classical horror (thank you, writer-director Douglas Heyes, veteran of both TWILIGHT ZONE and THRILLER). I'm also rather fond of GALLERY's ambitious Lovecraft offering "Pickman's Model," both the episode AND John Chambers' reptilian ratman. And another CREATURE FROM THE BLACK LAGOON connection, to boot — check out the ratman's body in "Pickman's Model." ( I wonder if it was the selfsame Creature suit that Cortlandt Hull photographed hanging on the wall at Universal in 1971 [see photo].) The belchy Creature "roar," unadorned from the movie, was also used as the sound of the glowy-eyed demon in "There Aren't Any More MacBanes." A small correction to an otherwise excellent interview: the Matheson story that he adapted into the TWILIGHT ZONE episode "Night Call" was published under multiple titles, but "Night Call" wasn't one of them. It appeared first in BEYOND FANTASY FICTION (November 1953) as "Sorry, Right Number," and later under his preferred title, "Long Distance Call." The change to "Night Call" was presumably required due to the second-season episode "Long Distance Call" by Charles Beaumont and William Idelson. "The Graveyard Rats" was, of course, adapted by William F. Nolan and Dan Curtis as a segment of TRILOGY OF TERROR II. There was a fabulous TV GUIDE article covering the creation of the "Pickman's Model" suit the same week NIGHT GALLERY first aired the episode. If memory serves, it featured color photos of freshly formed armor-plated arms and legs being removed from the Creature molds. And the Ratman headpiece made a bizarre reappearance on the shoulders of mini-monster Taz in Kenneth Johnson's "The Secret Empire" TV serial (part of Universal's CLIFFHANGERS weekly trilogy back in 1980 or so).